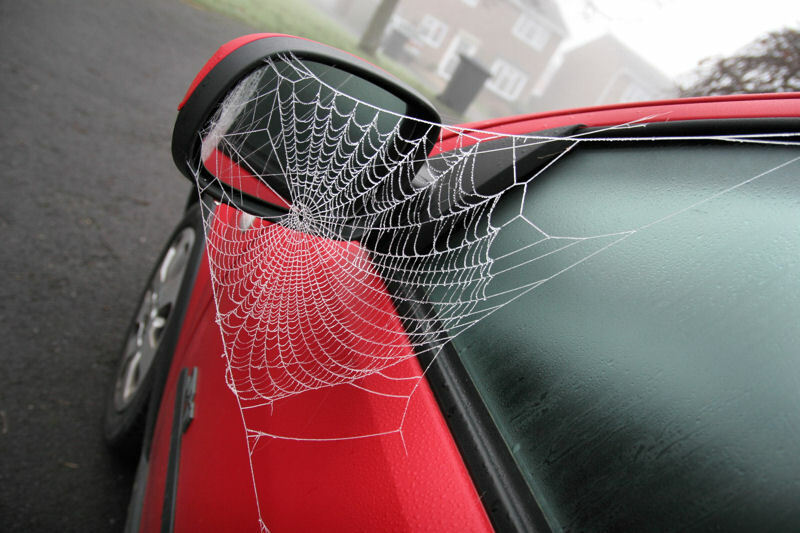 This year a spider has made its home in the drivers side rear-view mirror outside my car. It’s a tiny little guy whose legs are just barley visible dangling down from the top edge of the mirror, in a hermit crab fashion. I only noticed it’s web the first time in June, when the sun hit the silk’s reflection. What is even more interesting is that this is the second year in a row a spider has “moved in” to the same location. This seemingly odd spot for a spider to spin its web brings up many questions: Why did it choose this location? Does the mirror give it an edge to catching flies? How the heck does it hold on when I’m on the freeway? As I marvel at my spider friends home, I am reminded that humans have built many homes in stranger places over the centuries. Temples tend to be built in the most interesting locations on the planet. Perhaps, for the believer, traveling to the temple is seen as a spiritual journey in and of itself. 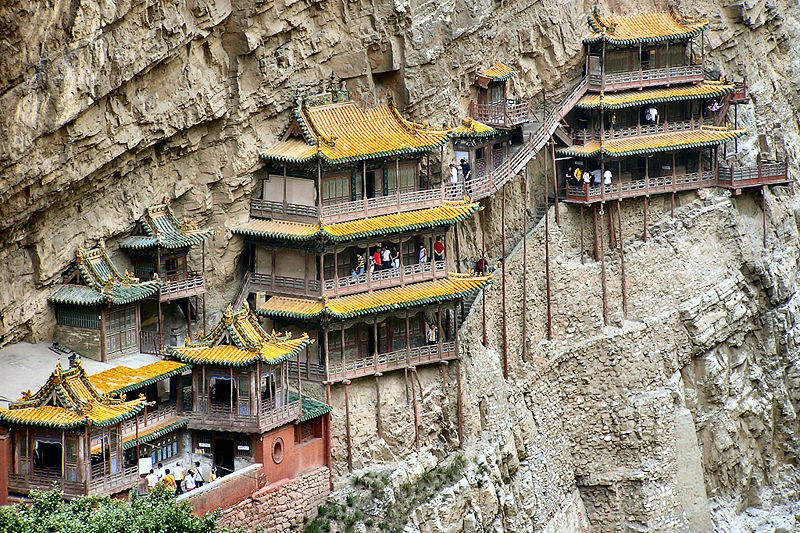 Take for example the Hanging Temple in China. This temple is the host to three different religions: Buddhism, Taoism and Confucianism. Built out of wood and dug into the side of the Dacist Mountain, Hengshan, this precariously positioned micro village sits 75 meters above the ground with more than 40 chambers connected by corridors, bridges and boardwalks. It is believe to of been built more than 1500 years ago at the end of the Northern Wei Dynasty by a monk named Liao Ron. Legend has it that Liao built the temple to suppress the monsters that caused the nearby river to flood often. Then there is the Roussanou Monaste in Greece. 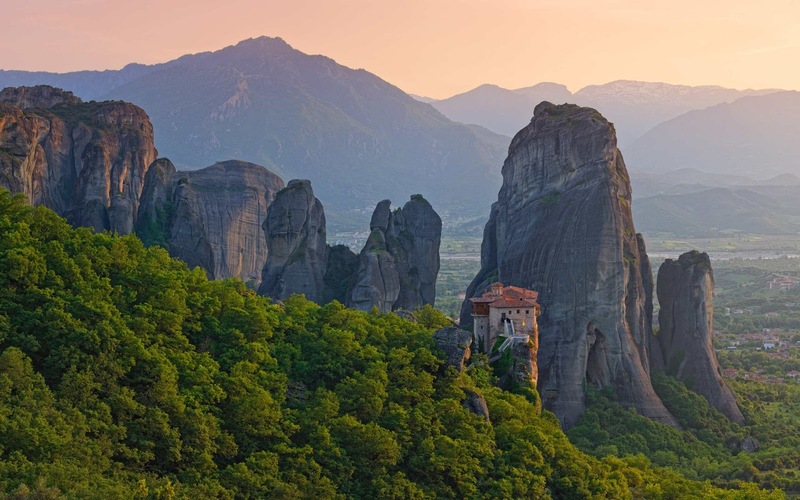 Tripadvisor claims “…this monastery is the most inaccessible of its kind.” Built in 1545 these monks wanted to get away from it all, including people. What was it like if there was ever a knock at the door? Did everyone crap their pants and shout “Holy cow! They found us!” Perhaps the opposite occurred. Balloons and glitter fell from the ceiling onto the head of the visitor in congratulations of surviving the trip. A gentleman named Maximos and Loasaph of Loannina (no less) founded the monastery. The site was dedicated to St. Barbara but the name Roussanou may be the name of the hermit who live on the rock during that same time. Since 1988 it has been occupied by a small community of nuns. The building covers the entire surface of the rock and consists of three levels: the church, cells and guest quarters. Thinking back to my spider friend, perhaps he is just giving the location a chance. However, the web is almost always empty, no flies. Sometimes when I am on the freeway I keep an eye on the little guy thinking he’ll blow off. Sure it’s inconvenient and a bit anti-social but it is protected. Humans build homes in remote areas to suppress monsters or find peace and quiet. My spider friend is protected from birds and weather. What a smart spider.